I discovered this last night while developing an Argentinian themed dinner party for our friends. I began researching the accompaniment we love to serve atop my husband's charcoal grilled skirt steak and while doing so learned, "an authentic chimichurri" simply consists of parsley, garlic, olive oil and lemon (red pepper flakes are also permitted). This Chimichurri Sauce recipe I found on-line (based on user reviews) claimed to be, "...about as authentic as it gets." After you make it once ...I think you'll know why. Don't forget to enter my FREE GIVEAWAY for your chance to win a beautiful tin of LA TOURANGELLE WHITE TRUFFLE OIL! You have until Friday, January 28 to enter and the winner will receive the White Truffle Oil in time for Valentine's Day Dinner! Place chopped parsley in small metal bowl. Whisk in 1/2 cup olive oil, lemon juice, garlic and crushed red pepper. Season to taste with salt and pepper. Refrigerate at least 4 hours. (Can be made 1 day ahead.) Bring to room temperature before using. *I doubled the recipe and pureed in a food processor (maybe that ruined the "authenticity" but I was making the chimichurri sauce for a group and desired a pureed consistency. That's ok. It's better late than never. I think you did an excellent job with this chimichurri. I am adding it to my list. I have to be honest, the last time I made chimichurri, I infused it with some cilantro because I wasn't the biggest parsley lover at the time. But now, parsley and I are BFF so I'm going to have to try this! Fancy name for a simple green sauce! I use this for marinating meat as well. Trust the Argentinians to come up with Chimichurri! Makes the the green sauce sound exotic I have to admit. It's delicious! Cheers! This recipe I will be saving! A few months ago I bought a jar of Chimichurri at Central Mkt; it does not pass the authentic test . It contained cilantro and vinegar AND ground pepper, garlic, curry, parsley, ming, oregano, sea salt, rosemary, corn oil, lemon juice. 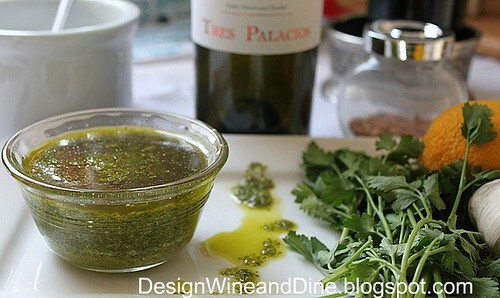 I just read a recipe for a gremolata sauce, which is identical! I HAVE to make this-- it sounds heavenly!! The steak would be lucky if it got any by the time my loaf of bread had its way!! 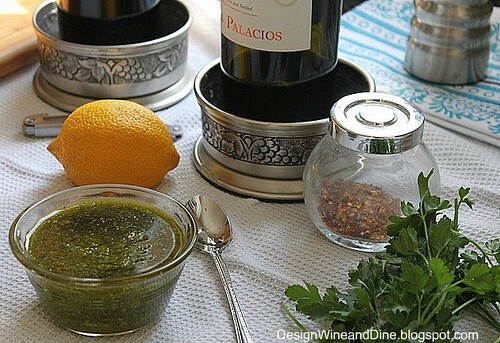 I LOVE chimichurri...and I too just realized recently that I had not been making it correctly... at least not authentically! Yours looks incredibly good..I could spoon it right into my mouth!! Thanks all for your comments! It's seriously fresh and delicious! There is no salt and pepper listed in the ingredients but when you get to the "preparation" part it mentions to salt and pepper to taste. ha, I love your warning - I am dangerous with bread and a good sauce! Wow, that sauce look so fresh. Thanks for posting this! I, too, dislike cilantro and was looking for a parsley-only sauce.